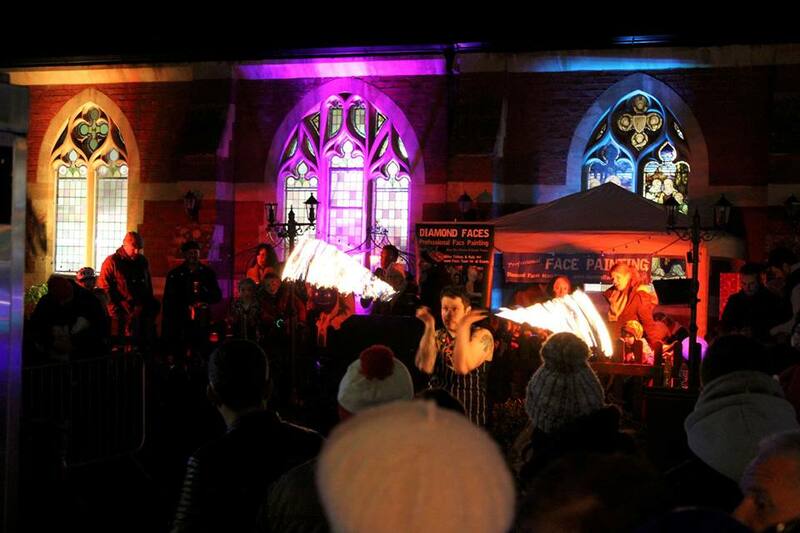 Saturday 3rd December saw crowds drawn to Westbourne for its first ever Christmas Fiesta of Lights. The light fiesta included LED balloons, UV lights, glow paint, fire shows, live music, performers and dancers, the entertainers wowed the crowds of shoppers and visitors with a unique and magical approach to the annual switch on. There was a buzz in the air as visitors joined shops and businesses as they kick started Christmas together alongside the Mayor and Mayoress of Bournemouth, several businesses stayed open until late for visitors. During the day children and families gathered to meet Santa and whilst waiting they were entertained by stilt walkers and face painters, as well as choirs and singers such as Rossano Sal and the Bournemouth University Big Band performing in the streets, getting shoppers in the Christmas spirit! Santa will be based in the Westbourne Arcade every Saturday from 10-4pm in association with Westbourne Rotary. Peter Treble Butchers on Poole Road hosted its annual 12 inch sausage eating competition which raised smiles and lots of laughter, as Miss Galaxy and the President of the Westbourne Business Association and Coastal BID Director, and Director of A-One Insurance Group Lia Martin also joined in the fun of the competition alongside other contenders! Conor Burns MP and Cllr John Beesley welcomed Santa as he cut a dash and arrived in style with his elf driving an open topped Bentley, to cheers from the crowd despite the cold winters morning, the dignitaries visited an array of shops and businesses including Richard Carpenter and his team at the Libertine, Attico, Fab Frocks, House of Lights, Peter Treble, and a special visit to the newly refurbished Beach and Body store on Seamoor Road as well as to Scape, By Arrangement and the recently opened Mediterranean restaurant Le Beyti, based in the arcade and Terrace Café. Lia Martin Chair of Westbourne Business Association said, “Christmas is vitally important to Westbourne and we are keen to draw as many regulars and visitors into our Coastal Village, with so many unique shops and eateries there is something for everyone, so come along join in the fun, enjoy a great experience and take advantage of our amazing offers this Christmas. Westbourne has something for everyone. We are rightly very proud of our unique shopping village with its wide range of independent shops and we are grateful to the Coastal BID for their support as well as to the whole team involved with these activities.